A thrift find in itself, the two-storey Quezon City home of Jinky was originally acquired by her parents in 1986 during the EDSA Revolution. Although beautiful, it’s dark, wood interiors didn’t sit well with the then college student which geared up her penchant for decorating. It was here that the collecting began. 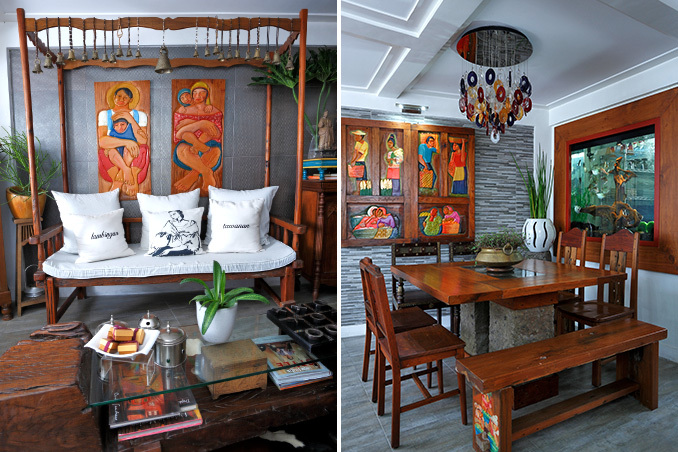 Jinky took to Filipino furniture pieces and accents to decorate her heirloom home. Her taste for the eclectic led her to humble crafters in Metro Manila, most of Luzon, and even Mindanao such as Agi Pagkatipunan. Incorporating those pieces with high-end designer furniture, knick-knacks, and hand-me-downs given by friends and family, she created beautiful spaces that perfectly blend rustic charm and modern sensibilities. It was her renovation of the home in 2012 that tied everything together—presenting itself as a blank canvas for the eccentric portrait she painted with her unique treasures and finds. Original Text by Katherine Lopez. Styling by Dagny Madamba and Paula de Guzman. Photographed by Ocs Alvarez/ Acme Innovatives. Read the original article ("Treasure Trove") in the November 2013 issue of Real Living Magazine. To download a digital copy of Real Living Magazine, visit Summit Newsstand at https://summitnewsstand.com.ph/real-living.